In the following review you can find out more about a product by the name of Derman Antifungal Cream. This product claims to eliminate most types of fungal infections which afflict the feet, such as the increasingly common tinea pedis (athlete’s foot), tinea corporis (ringworm) and tinea cruris (jock itch). 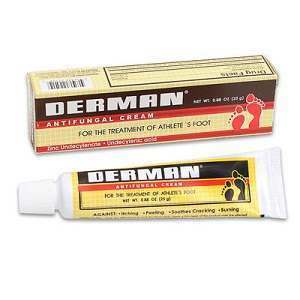 Derman Antifungal Cream also excels at suppressing the symptoms of these infections, as well as relieving any other discomfort the feet may suffer from, such as chafing, scaling and cracking of the skin, the sensation of burning, rashes and irritation, and last but not least, painful discomfort. If you want to learn more about Derman Antifungal Cream, its formula, and its price, keep reading. Both active ingredients found in Derman Antifungal Cream, Zinc Undecylenate and Undecylenic Acid, have a long history of being used as anti-fungal agents. These substances can curb the spread of fungal infections, and eventually eliminate them entirely if used regularly. When applied to the infected area, they immediately begin to inhibit the production of a particular enzyme which is essential to the development of the fungal cell membrane. This is the most effective method, and all anti-fungal substances work this way. If you’ve been researching anti-fungal medicines for a while, the following lines will be very familiar. Just like in the case of the active ingredients, the method of usage is identical with all anti-fungal products. You must clean and dry the afflicted area, and then spread a thin layer of Derman Antifungal Cream over it. Massaging the cream into the skin increases effectiveness, as that way the substance will reach the pores. If you want to cure an infection using this product, make sure to treat the skin in between your toes, and use the product at least twice a day. The infection should subside in 4 weeks. If that is not the case, or if irritation occurs, it is advised to seek medical attention. Some of the ingredients used in Derman Antifungal Cream may lead to the appearance of rashes or skin irritation in patients who are allergic to the substances involved. It is strongly advised to keep this substance away from your face, paying extreme attention to the eyes. Due to their highly sensitive skin, children under the age of 2 should not be treated with Derman Antifungal Cream, unless a doctor instructs you to. A single 1.76 oz. tube of Derman Antifungal Cream costs $5.18 with free shipping when purchased from Amazon, which is a fair price. Note that the price may be different in other stores. Unfortunately, Derman Antifungal Cream has no guarantee policy in place, since the manufacturer does not handle distribution. Derman Antifungal Cream is an effective anti-fungal cream which boasts a powerful formula and a fair price. Despite these points, we must acknowledge the presence of possible side effects, which are essentially the same symptoms as those that the product claims to cure, and the lack of a guarantee policy. Jimmy Rodriguez	reviewed Derman Antifungal Cream	on June 10th	 and gave it a rating of 2.5.